A glycemic index diet involves using a specific rating system predicting how fast carbohydrates will increase a person’s blood sugar levels following consumption. Carbohydrates that feature low on the glycemic index will cause your blood sugar levels to raise at a slower rate, leading to you feeling fuller for longer. According to the Mayo Clinic, this is the main reason why a low glycemic index diet helps to control your appetite and thus, can help you manage a healthy weight. If you take the time to compile a list of low glycemic foods, as well as make note of your favorite low glycemic recipes, you will only need to make a few simple lifestyle changes. 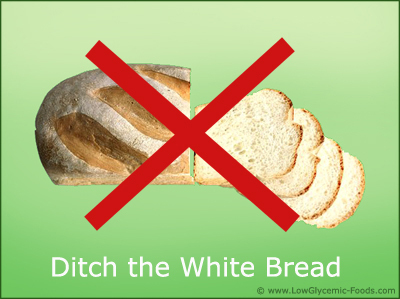 If refined cereals, white bread and bagels are an integral part of your diet, you will need to replace these with low glycemic index diet alternatives. Anything that ranks at 70 or above is considered high, whereas foods below 55 are considered low. White bread and rolls, puffed wheat and chocolate-covered cereals are among the worse offenders, as they rate well above 70 on the glycemic index chart. You should therefore consider replacing these with items that register below 55 such as, porridge oats, bran cereal, wholegrain bread and rolled oats. 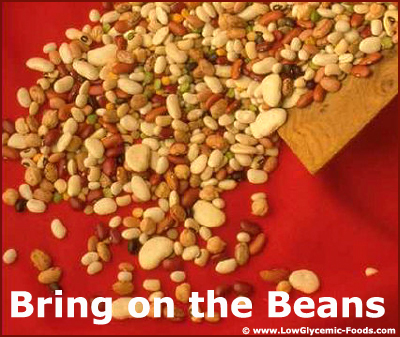 Beans are high in iron and protein, and therefore make a healthy addition to your low glycemic index diet. It doesn’t matter what type of beans you prefer, as all of them register at less than 55 on the index. As well as making a tasty ingredient in your low glycemic recipes, beans are also a great source of soluble fiber. This means that they help lower blood cholesterol too, says the American Heart Association. Broccoli, mushrooms, bell pepper, apples, citrus fruits, plums, spinach and cauliflower are just a selection of the fruit and vegetables you should stock up on if you are planning on following a low glycemic index diet. As well as registering low on the glycemic index, these fruits and vegetables are an unrivalled natural source of countless minerals and vitamins. Best of all, fruit and vegetables make ideal snacks, meaning you can keep your blood sugar stable throughout the day without ruining your appetite or increasing your daily calorie count significantly. White potatoes register high on the glycemic index chart and therefore, when possible, you should opt for sweet potato or yams as an alternative. It doesn’t matter how good you are at sticking to your diet at home, if you are going to throw it all out of the window when you eat out. Sticking to a low glycemic index diet requires consistency, meaning you should avoid the same foods when eating out, as when you eat at home – especially if you eat at restaurants frequently. To make life easier for yourself, you can take a list of low glycemic foods out with you – this will help you choose an appropriate dish for your diet. Alternatively, you could invest in “The Shopper’s Guide to GI Values”. This book gives you a comprehensive list of where a multitude of food sit on the glycemic index. This handy book is updated every year and contains tips on how to stay honest to your low glycemic index diet while eating away from home. The book also contains popular low glycemic recipes, making choosing a relevant dish in a restaurant much easier for you. 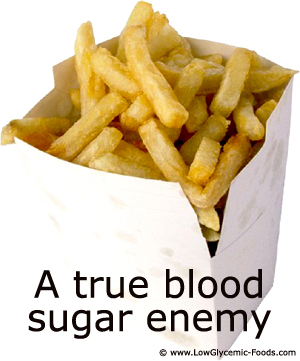 Too often people make the mistake of concentrating on the food when on a glycemic index diet. This is despite the fact that many beverages can contain ingredients that register high on the index. Natural, sugar-free fruit juices, in particular orange, apple, carrot and grapefruit, all register under the golden 55 on the glycemic index. Remember, if you are trying to lose weight, you will need to watch how many calories are in the food you choose to eat, as well as where it registers on the glycemic index. For example, some chocolate bars and chocolate milk have a low glycemic index count but are full of empty calories. When it comes to some of your favorite snacks, it is safe to assume that many of them will probably be off limits on the low glycemic index diet. However, the glycemic index of some snacks, compared to others, may be a shock to you. For example, the ever popular chocolate “Snickers” bar registers a mere 43 on the glycemic index, while half-a-cup of pretzels registers a staggering 84. One of the reasons for the surprisingly low Snickers score is the fact that it contains a low glycemic food, peanuts, which ‘combat’ the higher glycemic index ingredients. Other snacks that you may think are in the lower numbers of the glycemic index are saltines, vanilla wafers and doughnuts – all of which register between 78 and 81 on the glycemic index. The American Heart Association recommends erring on the side of caution when it comes to food that you are unsure of. If you have no idea where it rates on the glycemic index, it is better to leave it out of your low glycemic index diet and opt for something you know is definitely more suitable. When sorting out your favorite low glycemic recipes, it is important you find ones that fit into everyday living. For example, over-the-top dishes are fine for a treat or a special meal but you really need to find recipes that will make easy breakfast, dinner and teas, with the choice of a snack or two depending on how hungry you are. Quiche has to be one of the most popular low glycemic recipes for a number of reasons. Not only is it tasty and filling, the ingredients of your favorite recipe can easily be switched out to make the dish more fitting for your low glycemic index diet. Rather than using white or whole-wheat flour for your quiche, try grinding up oatmeal in a food processor instead. 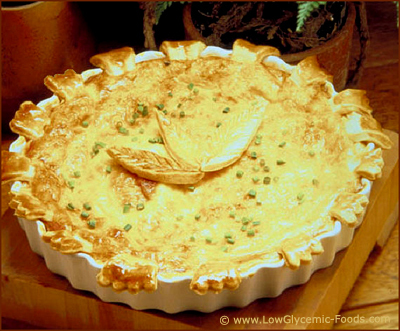 You can choose whatever flavor quiche you want, as long as you aware of the glycemic index count of the ingredients. One of the tastiest low glycemic recipes for quiche involves using low-fat cheese, scallions, sweet potato and basil. All of these ingredients combined make a tasty dish, that won’t ruin your low glycemic diet. Sauté a little garlic with some chicken pieces in some oil in a pan before adding chopped tomatoes, parsley and Cajun spice – to your own taste. As this cooks off, make some thin Vermicelli pasta and add it to the pan ensuring the pasta is evenly covered. In 15 minutes you have a tasty dish with a spicy kick that will complement your low glycemic index diet nicely. Because it is fresh it will taste 100 times better than any takeaway you may have had in the past. Eating a snack in between lunch and your evening meal will ensure your sugar level is kept at a stable level. This will prevent a sugar crash, which will result in you feeling hungry and looking to pig out on whatever you can get your hands on, says the Mayo Clinic. Easy to prepare snacks that are tasty too and can be lifesavers to those who may get peckish on their low glycemic index diet. Simply cover two lettuce leaves with a thin layer of low-fat cream cheese, a slice of lean ham and a couple of pieces of bell pepper and then roll up. This snack literally takes minutes to prepare and will fill you up nicely until your evening meal. You can even prepare some to take to work with you or pre-prepare so you have a nice snack waiting for you when you get home. Easy low glycemic recipes also include homemade chicken soup and shrimp salad – both can be made beforehand and both register low on the glycemic index as well as on calories. According to the Mayo Clinic, only two in five people who lose weight following a low glycemic index diet will manage to keep the weight off over a period of longer than six months. Like pretty much any diet, the end result is dictated by how well you perform. Unfortunately, many people view the low glycemic index diet as a temporary lifestyle change, usually switching back to their former eating habits once the weight has been lost. 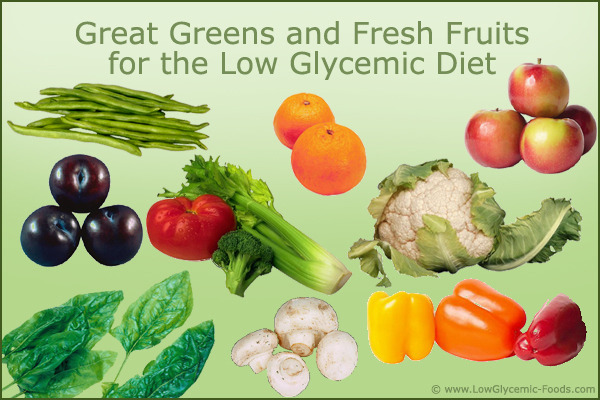 If you are looking to lose weight and then maintain that weight loss effectively, it is important that the low glycemic index diet you follow becomes a way of life. As well as making a list of your favorite low glycemic foods, it may also pay off to make a list of the foods that rate highly on the index. This will help you, especially in the early days, spot at-a-glance whether you can add something to your diet menu or not. 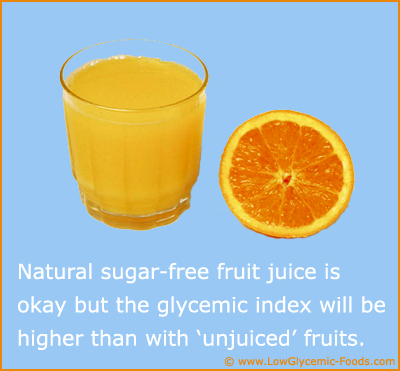 However, not all fruits register low on the glycemic index. 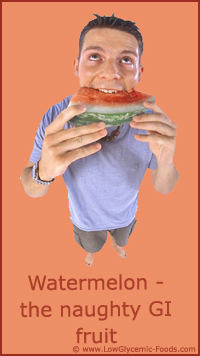 For example, watermelon, cantaloupe and pineapple all score over 70. Dates are one of the worse fruits to have while on a low glycemic index diet, as they register an unbelievable 103 on the glycemic index. Fortunately, the already-mentioned white potatoes are the only real vegetables you should be looking to avoid, as these do sit well up on the index. That is, unless you are a parsnip fan! The seemingly innocent looking parsnip registers a shocking 97 on the glycemic index. And the parsnip registers even higher if it is mashed, so it is best to keep it out of your low glycemic index diet altogether. If you are serious about following a low glycemic index diet, it is important you check the labels on the foods you buy for your low glycemic recipes. The exact glycemic index rating is gained through a thoroughly scientific experimentation, which you won’t be able to complete every time you do a shop. Therefore, you have to rely on the ballpark figure that manufacturers print on food labels to give you a rough idea of the glycemic index rating. You will need to find the total carbohydrates section on the food label, this is usually situated alongside the cholesterol, sodium and sugar counts. Underneath the total carbohydrates you will find sugar carbohydrates and it is these two figures you will need to divide to achieve the glycemic index rating. Thankfully, thanks to the raising popularity of the low glycemic index diet, such as the South Beach diet, most manufacturers have made it easier for people to spot the index rating – usually displayed in a green box on the front or back of the food packaging. Of course, if you cannot find the glycemic index rating on certain foods and you don’t feel capable of working it our correctly, having a list of low glycemic foods on you when you go shopping will be a real help. If you plan on trying new low glycemic index recipes, you can always use the Internet to check the exact index rating and ensure it is suitable for your low glycemic index diet before you go shopping.